Please contact us at info@kulladogs.com or 815.355.4749 for more info. 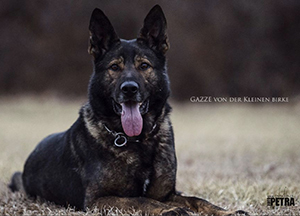 Gazze is trained, owned and handled by Mike Diehl, and together this team has consistently dominated national and international events for the past few years. Gazze and Mike won the 2017 AWDF Championship and went on to take 7th place at the FCI World Championship and 3rd at the WUSV World Championship. Gazze's protection work is as close to perfection as we see, with explosive, relentless guarding, perfect full grips and speed to the arm that challenges even experienced helpers. His young progeny are looking excellent, and we are very excited to incorporate him into our breeding program. Keep an eye out for Mike and Gazze in the spring 2019 championship trials. 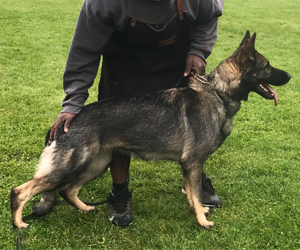 Dira is a beautiful and extremely driven bicolor female out of our V Athos von der Wannaer Höhen IPO3 KKL and SG Mia vom Geistwasser IPO1 AD. Dira is in training for her IPO titles and brings an abundance of drive and intensity to the work. Like her mother and grandmother before her, she is a natural tracking dog with high hunt drive and over-the-top food drive. An upper medium sized female, she is extremely athletic and loves to run for the pure joy of it. 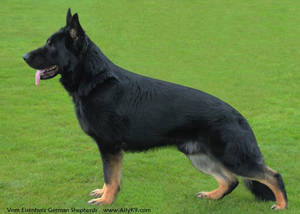 She is a joy in the obedience and is the type of dog that lives to engage with her handler, whether in play or work. In protection, she is very fast to the arm and truly enjoys the fight with the helper. Dira's is being trained by Jen (who trained her mother and her grandmother as well) and will achieve her first IPO titles this season. Dira vom Geistwasser pedigree, photos and videos. Six puppies (1M/5F) born 03.09.19! MADOX is a correct medium-sized male with impressive substance, beautiful structure and pigment and unflappable temperament. This male carries himself with confidence, and his dark eye and expression tell you everything you need to know about what he is from the character. A direct son of Uno Stadfeldt, Madox is a Paska Salzablick grandson on the mother's side, giving his pedigree a nice balance of drive and aggression. 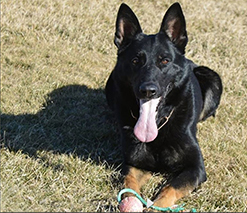 The Uno/His pups are excelling at a range of activities, from IPO, to conformation, to flyball, agility, and nosework. Hips SV fast normal, elbows normal. DM clear. Lola is the result of more than a decade of planning and some good old fashioned luck. She is the daughter of our V Boy von Zorra SchH3 KKL1 lbz and SG Prada von den Wannaer Hohen IPO3 KKL, mother to our V Athos von der Wannaer Hohen. The breeding combines the best of our foundation sire line, bringing Boy together with Athos's mother for a female that's the among the finest we've seen. Lola has strong drives for all three phases and is a calm, but powerful female that is often mistaken for a male. She is being prepared for her IPO/IPG titles by Bill personally and constantly impresses whenever she's out and about. Hips OFA Excellent, Elbows Normal.